Without fear of exaggeration, it can be stated that dental implants are the most effective, stable, and lifelike of all methods of replacing missing teeth. In fact, an implant-supported restoration is the next best thing to having a strong, healthy, natural tooth. At the oral surgery practice of Drs. Gerald Bird and Jay Johnson, we proudly offer implant dentistry of the most surpassing quality. Our experienced oral surgeons invest significant time and effort into the planning stage of implant dentistry, using state-of-the-art technology to ensure that dental implants are placed in the precise locations in the jaw that will ensure the best, most durable results. 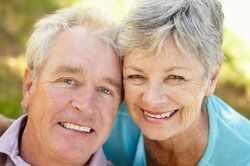 With proper maintenance and care, dental implants can provide decades, and possibly even a lifetime, of support for crowns, bridges, or dentures. Drs. Bird and Johnson also offer plasma-rich platelet therapy, an innovative technique in which a patient’s own blood samples are injected into the surgical site to promote quicker healing. This can help to accelerate the osseointegration phase - the all-important phase in which the titanium implant posts fuse with the jawbone - which allows patients to restore health, form, and function to their mouths in as short a time as possible. Of course, dental implants - especially of this level of quality - represent a substantial investment on the part of the patient. However, the success and longevity of dental implants depends largely on the skill and experience of the surgeon performing the implant surgery. Drs. Bird and Johnson have decades of professional experience and are board-certified in oral and maxillofacial surgery. This makes them specially trained and qualified to deal with issues involving the jaw, periodontal tissues, facial aesthetics, and other matters that are not required in the education of general dentists. At our oral surgery practice in Melbourne, dental implant costs are discussed in detail during confidential, one-on-one consultations with our skilled surgeons. There is no way to estimate the cost of your treatment without first meeting with you. In general, it is a good idea to be wary of any practice that advertises low-cost implant dentistry without first meeting with you, evaluating your mouth, and assessing your needs. Also, be careful to note that many general dentists state that they offer dental implant restorations, which means that, although they provide the crowns, bridges, or dentures affixed to the implants, they most likely refer the actual dental implant surgery out to another professional. This can add to the overall cost of your treatment. Whatever the ultimate cost of your dental implants at our practice, you will be able to rest assured knowing that your treatment is being handled from beginning to end by professionals who are among the most esteemed in the nation. Ultimately, it is far more cost-effective to have your dental implant surgery done right the first time than to save a bit of money up front, but later pay for compromises in quality and cut corners. Drs. Bird and Johnson would welcome the opportunity to explain to you why dental implant surgery at our practice is the right choice. Please contact our oral surgery center to schedule your initial consultation today.